Photography days are intended for photographers and photo clubs. Participants will have the opportunity to photograph the birds in flight, working and "posed" in their natural habitat. Introductory talk by Paul Manning on the history of falconry with instruction on how to approach the birds. You wil start off photographing the birds whilst they are on their perches. This is an ideal opportunity for close up photography, so make sure you bring the right lens with you. Photographing the birds in flight is never an easy task. You will have plenty of opportunities to capture that special image. 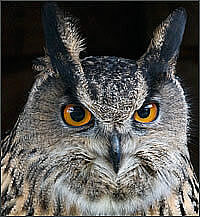 You will now photograph them on the falconers gloved hand standing erect and with their wings open. Most of the afternoon will be spent photographing the birds in their natural habitat, in the grass, standing on branches etc - including Amber the magnificent Eagle Owl. Before leaving for home you can (if you wish to) hold the birds and be be photographed with them, under the supervision of the falconer. £50 - £100 per person dependant on location and catering requirements.